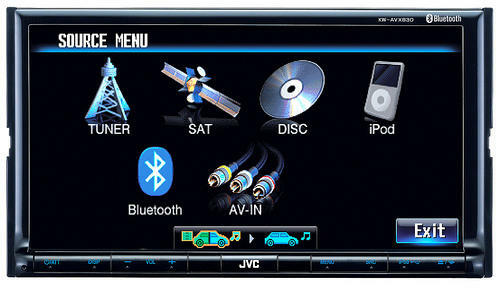 JVC had a range of in-car entertainment gizmos on show at CES 2010, including this, the JVC KW-AVX830 on show. This is a beast of an in-car gadget featuring a huge 7″ screen, proximity detector (the unit switches itself on when it sense your hand, and then off again, when you return to the somewhat important business of driving! ), and a USB connector, through which you can connect your trusty iPod or iPhone. You can do more than just connect iPhone, though – you can also access your iPhone’s Contacts, change from hands-free to private conversation with the push of a button, and switch a Bluetooth connection seamlessly between two separate mobile phones. And if you want to watch video form your iPod or iPhone – well, why not?! Sure, you’re in a car, but it would be criminal to have a 7″ screen and not show videos on it!